Summoned by a signal from one of his bravest warriors, Optimus Prime thunders down through the space above Earth and races into battle, his Protoform body tracing a fiery path across the sky. Most powerful among the Autobots, he is dedicated to the recovery of the Allspark, and the protection of both humans on Earth and his own people back on Cybertron. Scanning an Earth truck, he morphs into a form that will allow him to hide until the time comes to enter battle against Megatron! Robot Mode: Protoform Optimus makes for a pretty sleek robot. His posability is a bit hampered by the wing-like plates attached to his hip, but apart from that he can move pretty freely. The designers tried to emulate some of the familiar Optimus-features, such as the windows on his chest, the exhaust stacks on his shoulders, and his familiar weapon (more or less). Still, while the robot mode looks pretty good, it doesn't really look a lot like an Optimus Prime to me. The head reminds me more of Energon Dreadwing rather than Optimus Prime. So bottom line, a good robot, but a not-so-good Optimus-robot. Vehicle Mode: With Optimus' space mode the designers tried to find some kind of middle between the kind of comet-shaped re-entry craft one would reasonably expect from a vehicle mode designed solely for space travel and Optimus' familiar truck mode. Unfortunately the result is a misshapen blob that tries too much and ends up looking pretty bad. 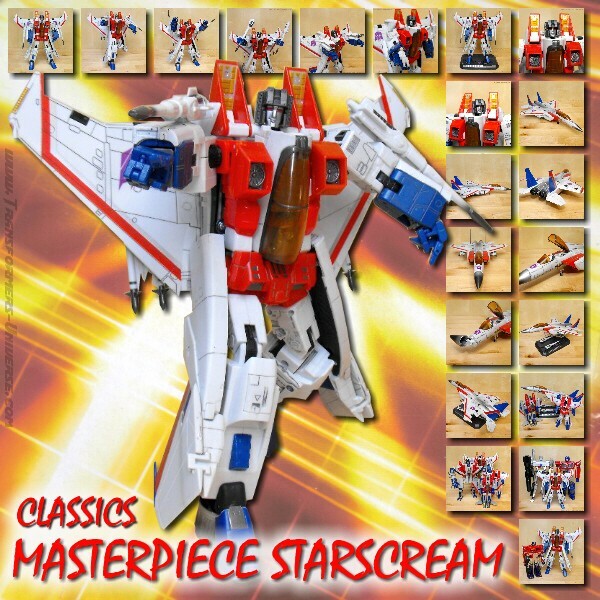 I much prefer the vehicle mode of Protoform Starscream. This one here just looks silly. Remarks: While I do like my Optimus Primes, I have to say that Optimus is the weaker of the two Protoform figures that came out as previews for the Movie line. He's not a bad figure, but with an ugly vehicle mode and a robot mode that, while good, doesn't resemble Optimus Prime all that much, I can't say too many positive things about him, either. So if you like his look, get him. If you're looking for a good Optimus Prime, look elsewhere.